The attractive foliage of Robinia ’Frisia’ provides a pleasing backdrop for a herbaceous border. Consider the mature size and shape: Never buy a tree without checking what height and spread it will reach at maturity, or at least after ten years’ growth. 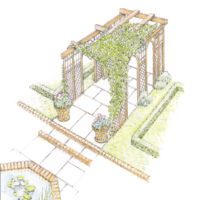 This will help you choose the right tree � neither too tall nor with too wide a spread � for your garden, and the right place to grow it. Conifers and evergreens can cast a lot of shade, especially when the sun is low in the sky in winter. Due to the density of this shade and the inhospitable soil conditions created by the fallen needles of most conifers, other plants are unable to grow beneath them. Think local Garden centres and numerous flower shows unveil magnificent new species every season. But try to resist the fashion for rare varieties unless you are already an experienced and knowledgeable gardener. 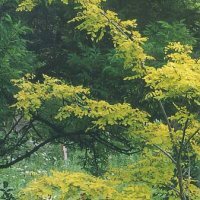 Visit the local nursery for the best choice of trees to suit your garden. It’s always useful to know a plant’s common name as this can give you a clue to its place of origin and thus to its ability to adapt to your garden. For example a Cape plumbago, a pineapple guava or an Italian cypress are likely to fare badly in cold British winters. Some trees, such as mimosa, are not fully hardy so are unsuitable for exposed sites but will grow well if sheltered. Young trees establish quickly: It’s not always a good idea to buy plants that have developed into young trees. Those with a good�sized trunk and a spread of branches will already have spent several years growing in a nursery bed or a container, and transplanting them to your garden will cause them inevitable stress. If the tree has been field�grown, some of the root system may be left behind when it is uprooted, and the tree will have to re-grow sufficient roots to anchor itself and absorb water and nutrients, while also adapting to its new environment. It may be better to spend less and buy a younger, smaller tree that will settle in more quickly. It will soon catch up with the older tree, whose energy will be concentrated on establishing a good root system instead of making top growth. Trees are sold in two basic forms ~ as saplings or as standard specimens. A sapling, or whip: A young shoot that has not yet achieved its proper formation is a sapling or whip. It can be as much as two metres tall. This is an economical way to buy a tree, but you will need to know how to prune it over the two or three years following planting, in order to obtain the desired shape. 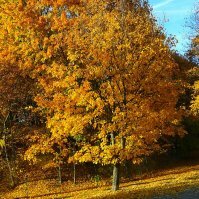 A standard: A tree that has spent several years growing in the nursery and has been professionally shaped to display the canopy, or leaf surface area, that constitutes its structure. The trunk alone will be around two metres tall. Nurseries describe their standards in terms of girth or circumference, rather than diameter. This is shown by two numbers written on the label, allowing for a margin. So, a standard labelled 12/14 has a girth when sold of 12�14cm, measured at one metre above the ground. This measurement should not, of course, be taken to indicate the eventual circumference of the trunk once the tree has reached full maturity, as the tree is likely to continue growing for many years to come. Is it a tree or a shrub? It can be difficult to define a tree. Broadly speaking, a tree has a trunk with branches that grow upwards from its crown. But some trees, notably conifers, grow branches along the whole length of their trunk: other trees have supple branches that bend down to the ground, called weeping or pendulous trees. The branches of others grow along the ground, with no trunk at all. Even height is no guide, as some trees peak at one metre, while some of the larger shrubs can, in maturity, reach three or four metres. If you are in. 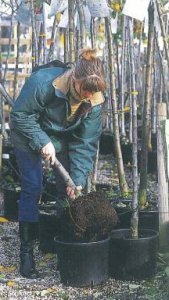 any doubt as to the eventual size and suitability of your chosen tree, seek some expert advice from staff at a specialist tree nursery. Buying on a grand scale: For instant impact you can buy semi-mature trees from specialist nurseries. These will have been grown in open ground for anywhere between five and ten years, sometimes longer. The time spent nurturing these trees is reflected in their price. They have to be dug up using specialist equipment, transported to their new home and then often lifted into place using a crane. 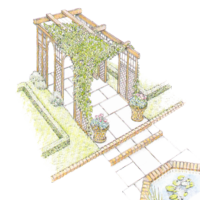 Normally these nurseries cater for professional gardeners and landscape projects, but they are available to anyone prepared to pay the price. Buying out of season: As long as a tree is containerised you can plant it at any time of year, but don’t be tempted to plant a bare rooted tree unless it is dormant. Even if a tree is container�grown it still needs regular care. If you plant in spring or summer, water regularly and ideally keep the soil cool, especially during hot weather. 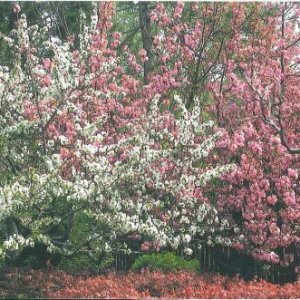 Flowering cherries and other spring-flowering trees are among the most popular, and many gardens have one. Small is beautiful: If you have a small garden, and particularly if you have to plant trees near to buildings, restrict your choice to dwarf varieties or those that are particularly slow-growing. This will ensure that you are not in any danger of planting a tree whose roots will later undermine your house. could try one of the smaller Japanese cherries or a bay tree (Laurus nobilis) � useful for culinary purposes as well as being an ornamental evergreen � but remember that trees housed in planters must be fed regularly. Transporting trees: Tree purchases rarely fit easily into the family car and often end up poking_ out of the sunroof, tied to the roof rack or even sticking out of the open tailgate. Be very careful that you don’t cause the tree undue stress on its journey. The temperature of the exposed tree will drop by 1�C for approximately every six miles per hour of speed. So if the car is travelling at 30 mph and the external temperature is 8�C, then the‘ exposed branches are actually experiencing 3�C. Any faster and the real problems start. At 60mph this temperature would be �2�C. At that stage, especially if the journey is long, the roots will begin to freeze, and the tree will struggle to recover. Wrap your tree well using plastic bubble wrap to cover any exposed areas during the journey and protect them from cold.